Last week, Google announced a change in the way sitelinks are displayed. Now, up to 12 links can be displayed on brand searches. According to Google, displaying more results allows visitors to quickly navigate to the section of the website they're looking for. It certainly lets you dominate the search results - but only if you have that #1 ranking! Launched in 2006, sitelinks are pages inside your site that Google displays for searches for your brand name - which are shown underneath your main result (normally your homepage). Once a single row of 4 links, they then evolved into 2 rows of up to 6 links. From 2009, sitelinks were introduced to PPC Ads - which allowed advertisers to create more rich, targeted adds, driving more profitable traffic. So, will all sites get extended sitelinks? In short, no. The sites which currently have expanded listings: are older, and have a high level of traffic, a large amount of content and a deep navigational structure. It also depends on the brand name. If there are multiple businesses with the same (or very similar) names, Google will not show such an extended listing for any (e.g. penguin where it is unclear what you are searching for, compared to penguin books). How does Google select the specific sitelinks? "We only show sitelinks for results when we think they'll be useful to the user. If the structure of your site doesn't allow our algorithms to find good sitelinks, or we don't think that the sitelinks for your site are relevant for the user's query, we won't show them." It is possible for site owners to remove specific site links for specific search queries via Google Webmaster. What does it mean for business websites? - more targeted traffic: with optimised sitelinks, you can potentially push visitors to specific sections of your site - for example to your bestsellers or "offer of the month". But don't expect more traffic - visitors already searching for a specific brand will click on a listing regardless of the size. - reputation management: with your result taking up more space, it pushes any other results further down on the page. The other results might even be managed by you - for example your Facebook or Twitter pages. This allows you to be even more in control of the results displayed. - don't panic! Remember, this update is only for brand searches - visitors typing your company name into Google. This means they're already looking for you - and will click on your website regardless of the way the result is displayed. - keep up the SEO work to ensure you get/keep that #1 result spot. Generally, it is easier to get a good result for your brand name (such as "Art Division" or "Tescos") than a broader searches like "graphic designer London" or "new toaster". Your need to be optimising your site for your brand name (the easiest way is to take the domain name of your company e.g. www.yourcompany.co.uk), and also for keywords/ phrases chosen with the help of an SEO specialist- that reflect your business. How to benefit from the new sitelink display? - site architecture & design: the possibility of having up to 12 sitelinks displayed means that site architecture becomes more important than ever, as for site design. By using Googles Webmaster tools and considering how and which pages to optimise, you can influence which pages are displayed. - control which sitelinks appear: blocking sites you don't want to appear is easily done using the Google Webmaster tool. But what about those you do want to emphasise? Have a look in analytics at your top landing pages (or perhaps those which generate the most sales or sign ups), and build on them by growing the inbound links to these pages. This means there's more chance they'll be displayed. - PPC competitor brand bidding: as the new sitelink display means the top result takes up a large amount of space, it means that visitors see less alternatives (as the lower ranking results are further down the page). This could mean that the clickthrough rates of ads on branded searches increases. 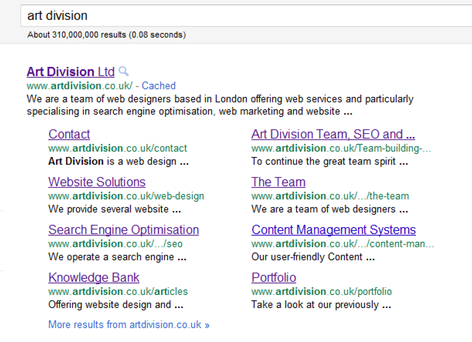 For more help with your online marketing, feel free to contact us at Art division, http://www.artdivision.co.uk/.